Grafting is an agricultural technique where the tissue of two different, but related plants, are joined together to continue their growth as one single improved plant. Grafting is an ancient method that was in use in China before 200BC. From there it spread to the rest of Asia, Europe and the practice was well established in Ancient Greece. Being at the forefront of technological advances in International as well as local agriculture, Hishtil SA has conducted extensive trails with grafted vegetable seedlings throughout the country. Growers are reporting improved disease resistance, increases in production and better product quality, all through the use of grafted seedlings. Crops such as watermelon, cucumber and tomato are commonly grafted around the world with countries like Greece and Spain, grafting 100% of their watermelon crops and Korea grafting 95% of all planted cucumber crops. Statistics for South Africa are not available in detail yet, as the practice is relative young in terms of vegetable, with commercial grafting being available for the last 10 years. The following information is available due to consistent commercial use of grafted plants. The use of grafted watermelon seedlings has become common place amongst world producers, this includes South Africa. Due to increased cropping on soils, instances of Fusarium are on the rise in watermelon production. Clearing new fields is becoming increasingly costly and alternative options need to be explored. 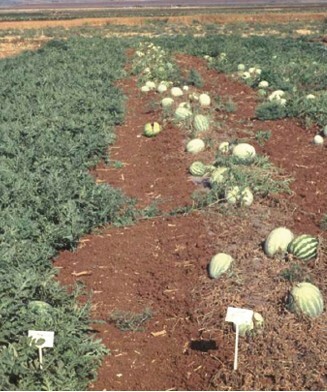 Extensive commercial plantings of Grafted Watermelons seedlings have shown a high level of tolerance to the Fusarium on old watermelon fields. This reduces the amount of time needed to rotate back onto old fields and is a much more economic option for farmers. Where traditional rotation of watermelon is between 7 and 10 years, rotation when grafting can be reduced to between 3 and 4 years. When planting grafted watermelon, a greatly reduced plant population can be used without affecting the final yield. Traditional non-grafted plant populations vary from between 5500 to 6000 plants per hectare. 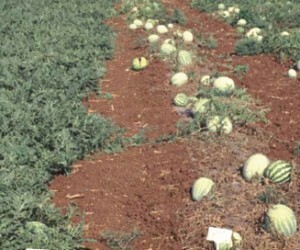 Grafted watermelon can be planted at a population of 3300 plants per hectare. Growers are reporting increased yields, better longevity of fields and therefore extended harvest times. Reports of increased fruit quality and shelf life of fruit is also common amongst commercial growers of grafted watermelon. This has opened new market opportunities for growers not previously available including the export of whole fruit to Europe. Increased fruit size was observed and higher quality fruit is being harvested from grafted tomato plants. Un-grafted plants show reduced vigour and vitality when compared to grafted plants in the same structures. These results are proving to be consistent in plantings across the country. It is however important to note that not all rootstocks are suitable for all conditions and disease pressures. It is advised that trials be undertaken to establish the best rootstock for individual conditions and needs. The choice of rootstock will affect how much plant populations can be adjusted. As with grafted watermelon, grafted cucumber has shown great tolerance in surviving soil borne diseases. Due to the immobile nature of growing structures, the build-up of diseases such as Fusarium in the soil is inevitable. Continued pollution of water used for agriculture has also increased this pressure. Growers have found an economical, sustainable and reliable solution to these problems through the use of grafted seedlings on an appropriate rootstock. With increases in coal and transport costs, the heating of growing structures is becoming more and more expensive. Trails conducted over multiple seasons have consistently shown that cucumbers grafted on a suitable rootstock have more tolerance to colder weather. Where grafted and un-grafted plants were planted in the same structures, un-grafted plants simply collapsed from the cold. Grafted plants however continued showing active growth and consistent fruit production. This allows growers to benefit from higher market prices during winter. Irrespective of the season however, growers report consistent increases in production and decrease in disease incidence when comparing grafted seedlings to un-grafted seedlings. When making the decision to graft, the choice of nursery is of equal importance. Grafting is a very sensitive process, involving extremely expensive seeds. As a farmer this may be the most important consideration. Hishtil SA has over 20 years of international experience with grafting alone. Both South African facilities (situated in Mooketsi, Limpopo and Riebeek West, Western Cape) offer high tech production structures that are fully protected from the elements as well as insect vectors. Anti-virus netting covers all the greenhouse structures and are therefore protected from aphids, whitefly and numerous other insects that spread viral infections. Hishtil SA is also the only nursery facility in South Africa that has achieved and maintained Global Gap certification. Using a facility with this certification will ensure the traceability of all raw materials to their point of origin. This assures farmers of the safest and most professional start to their business by providing them with an unsurpassed bench mark of quality in meeting their contractual obligations. When with Hishtil SA, a copy of the Global Gap certificate is available upon request and can streamline the farmers audit process greatly. When interpreting not only local but also international global trends, Hishtil South Africa has clearly identified the move towards grafted seedlings. It offers cost savings in terms of land clearing and immovable structures. Grafting offers solutions against rising disease pressure as well as improved quality and yield, translating to a better competitive advantage in a very contentious market.